This product requires a check of customer qualifications. CLICK HERE to download qualifications form. The Comprehensive Receptive and Expressive Vocabulary Test -Third Edition (CREVT-3) is an innovative, efficient measure of both receptive and expressive oral vocabulary. It is a norm-referenced assessment tool used to identify, describe, and quantify oral vocabulary proficiency in children and adults. Specifically, it can be used to identify individuals who are significantly behind their peers in oral vocabulary facility, note discrepancies between receptive and expressive oral vocabulary, document progress in oral vocabulary development as a consequence of intervention programs, and measure oral vocabulary in research studies. All new normative data (N = 1,535) were collected from a demographically representative sample of the 2011 U.S. population ages 5-0 through 89-11 years. Outdated photos (i.e., automobile, truck, mailman, vacuum cleaner, shaver, stove) were replaced with more contemporary photographs. A pronunciation guide for administering both subtests is provided in CREVT-3. Studies showing the absence of gender and ethnic bias have been expanded. The composite score has neither floor nor ceiling effects. Reliability coefficients have been computed by age and by gender, ethnic, racial, and exceptionality subgroups within the normative sample, as well as for the entire normative sample. Numerous validity studies, including sensitivity, specificity, and ROC/AUC, have been provided. Raw scores can be converted to age equivalents, standard scores, percentile ranks, and descriptive terms. Consistently strong reliability and validity evidence provided. 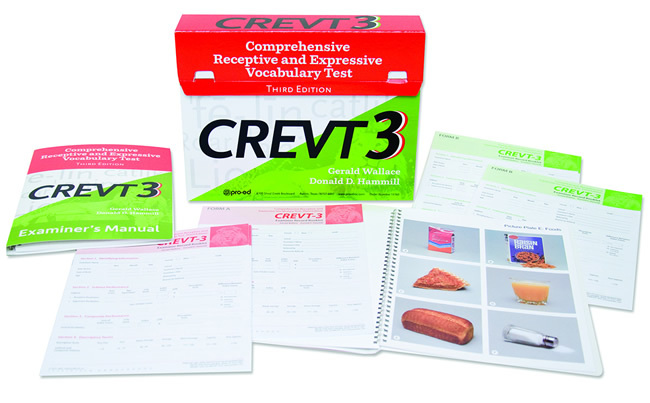 The CREVT-3 has two subtests. The results of the subtests can be combined to form an overall General Vocabulary Index. The format of the 76-item Receptive Vocabulary subtest is a variation of the familiar “point-to-the-picture-of-the-word-I-say” technique featuring the unique use of thematic full-color photographs. This subtest is made up of 10 plates, each of which comprises six pictures. All of the pictures on a plate relate to a particular theme (animals, transportation, occupations, clothing, food, personal grooming, tools, household appliances, recreation, and clerical materials). The themes represent concepts with which most people are familiar. Five to eight words are associated with each plate, and the words are spread evenly from young children through adults. The examiner begins with Item 1 on the first plate and asks the person being tested a series of words, one at a time. After each word, the examinee selects from six photographs the one that best goes with the stimulus word. When the person misses two words in a row, the examiner introduces the next plate. The pictures used with the Receptive Vocabulary subtests are spiral-bound in a Photo Album Picture Book featuring laminated covers fir ease of use and durability. Each plate is printed in full color on heavy, varnish-sealed cover stock designed for frequent use. The high-quality color printing of the photographs won an Award of Excellence from the Printing Industries Association of Texas! The Expressive Vocabulary subtest uses the “define-the-word-I-say” format the most popular and precise way to measure expressive vocabulary. The format encourages and requires the individual to converse in detail about a particular stimulus word, making it ideal for measuring expressive ability. The 29 items on this subtest pertain to the same 10 common themes used in the Receptive Vocabulary subtest (animals, transportation, occupations, etc. ), allowing for easy transition from subtest to subtest. The applications of basals and ceilings allow the subtest to be given quickly and make it appropriate for a wide age range. The General Vocabulary index is comprised of the Receptive and Expressive Vocabulary subtests. It represents overall ability in the area of oral vocabulary. To administer this test at least a master’s degree is required, with state licensure OR certification from a professional organization (ASHA, AOTA, APA, AERA, ACA, AMA, NASP, NAN, INS) that requires formal training and experience in ethics, psychometrics, statistics, and scoring and interpretation. Tests of perceptual, academic, and functional processes used in schools, clinics and rehabilitation settings are of this level. “All test users, regardless of level and profession, are expected to abide by the standards set forth by the APA, AERA and NCME regarding the ethical use, protection and dissemination of all test materials. All orders for the products listed below, must be placed on official institutional purchase order forms or professional letterhead. The purchase of this product requires a check of customer qualifications. Orders for items on this page cannot be completed online. Please attach completed qualifications form to your institutional purchase order or professional letterhead when ordering this product. For questions or help placing your order for these items call (800) 880-4433.